Read our review below about Curcumin C3 Complex. Thus flavoring spice has free radical, detoxifying and liver protective scavenging properties, as it is rich in Curcumin. Curcumin further also supports many systems as an antioxidant and it also reduces inflammation and supports joint health, immune system, and cognitive function. 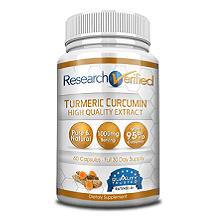 The only active ingredient used in this formula is Curcumin. It has been shown to help manage cholesterol and support gallbladder and liver function. This product contains 475mg/95% Curcumin per capsule. Bioperine has also been added to assist with the absorption of Curcumin. Only 5mg has been added to this formula, though it should be around 20mg per serving for optimal benefits. If the ingredients are included in the correct amounts in these types of formulas it should also assist with treating depression (increasing serotonin levels), providing relief from joint pain, reducing inflammation, supporting menopausal symptoms, PMS and many other health-related issues. The only inactive ingredients found in this formula are vegetarian leucine, microcrystalline cellulose, and vegetable cellulose. One capsule should be taken daily with breakfast and one capsule should be taken with lunch. Your doctor should be consulted before taking this product if you have gallbladder disease, have gallstones, are nursing or pregnant. Two weeks before elective surgeries – use of this product should be discontinued. This formula should also be kept out of reach of children. One bottle, containing 60 capsules can be bought for $29.43. $1.47 (5%) can be saved on this product if you subscribe to receive the product on a regular basis. A further 15% can be saved on this product if you subscribe for 5 products or more. It was quite concerning that we couldn’t find any information on a money-back guarantee. This might mean that the manufacturer is not confident about the effectiveness of their products. There are many manufacturers with similar products, who offer satisfaction guarantees of up to 90 days. After we reviewed this product, we found that it might be a powerful blend when it comes to reducing inflammation, supporting cognitive function, immune system, and joint health. They are currently offering some discount options if you subscribe for the product to be delivered on a regular basis. You can get up to 15% discount if you subscribe to 5 or more products. 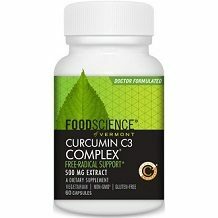 This formula does contain 95% Curcumin per capsule, which is great for managing cholesterol and supporting liver and gallbladder function. But we did find that the amount of Bioperine added in this formula is not enough. They use only 5mg per serving, while 20mg per serving would be the ideal amount for optimal benefits. As Bioperine assists with the absorption of Curcumin, the amount included is quite important in order to effectively treat depression by improving serotonin levels, reducing inflammation and supporting PMS and menopausal symptoms. We lastly, found it quite concerning that the manufacturer doesn’t offer a money-back guarantee. This might be because there are some concerns in terms of how effective their products really are.